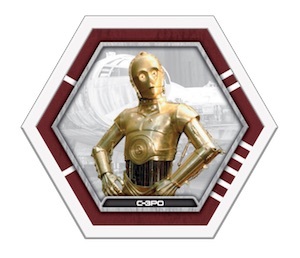 Topps Star Wars Galactic Connexions Discs offer collectors a new spin on Star Wars collecting. 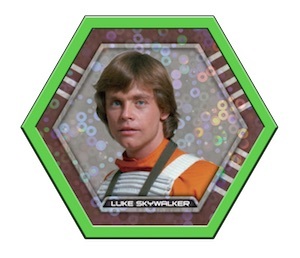 The detailed discs are reminiscent of Topps Chipz, but feature a hexagon shape and are built around a strategy game. The discs are exclusive to Wal-Mart and can be found in stores and online. Meant for two players or teams, the basics of the game involve "connecting" discs. 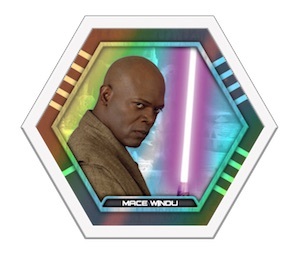 Each disc has six sides, with the top and bottom designated as open spaces and the remaining spaces for abilities (Attack, Honor, Intelligence and Deceit). Connections can only be made with discs that feature a higher ability level. Participants earn points by making connections and that decides the winner once there are no remaining moves. View full details on playing the game (PDF). 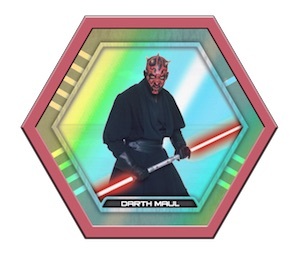 The main 2015 Topps Star Wars Galactic Connexions set includes 75 different subjects and a variety of parallel versions that push the total number much higher. All 16 different options are broken down by rarity below. 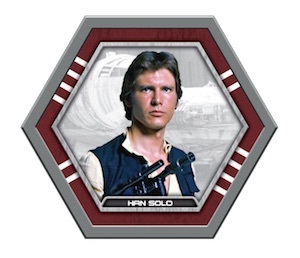 In addition, ten Blue Starfield Discs are available for a limited time at participating Wal-Mart stores. They are not found in regular packs. 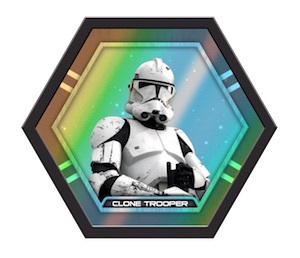 Series 2 features new options and 75 more discs in the base checklist. 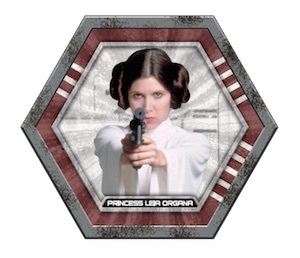 There are also ten more promo discs and a 14K Solid Gold Disc for Leia, this time Princess Leia Disguised as Boushh. 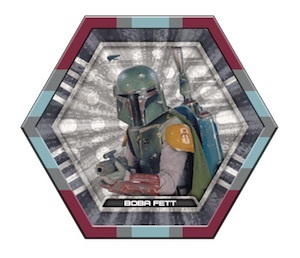 Series 2 releases 12/18/2015 exclusively at Wal-Mart. Series 3 releases May 4, 2016. In addition to 100 more discs, various parallels, and a 14K Millennium Falcon chase, the main checklist is split across several formats found only at Walmart. 75 subjects. Shop for discs on eBay. 10 subjects. Part of limited Wal-Mart giveaway. 75 subjects. Shop for Series 2 discs on eBay. All subject included in parallels below unless otherwise noted. 10 subjects. Part of limited Wal-Mart giveaway determined by the individual locations. 6 subjects. Part of limited Subway (inside Wal-Mart) giveaway determined by the individual locations. 1 subject. Exclusive to TFA soundtrack at WalMart. 100 subjects. Wal-Mart exclusive. Releases May 4, 2016. The 10 blue starfield exclusives are only found with a blue starfield background. Many of the others also have a blue background but also have grey, black, and clear backgrounds. How or what is the difference between the imperial red an light-saber red disk as they are both red? 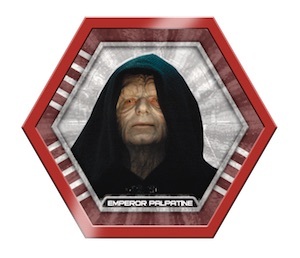 I have seen the Emperor on the imperial red disk in pictures but is he the only one on that kind of disk or are there also others on imperial red disk like a stormtrooper or Luke? If I am putting a collections of the star wars connexions together, I want to make sure I have my checklist correct. In the group of 1 through 75 there will be 3 of each ones; a common, uncommon and rare so we are looking at 75 x 3 or 225 disks. This plus the 10 Wal-Mart give-aways and the 1 solid gold card. I hope I am correct with this. Please let me know or give me the actual checklist of all variations. I have some of the Blue Starfield Disks and there are more than just the 10 that are listed there. I got 9 packages and of the 10 you have listed I have only 2. Sooo my question is are the 10 listed the ULTRA RARE ones? There are 10 characters that ONLY come in Blue Starfield. So there are 85 total Blue Starfield characters for each series. 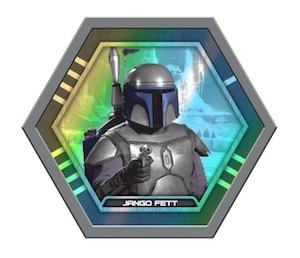 Each of those characters come in non foil and foil versions. Got some series 3 today, seems like rates and ultras aren’t as tricky. The numbers are a nice touch, as well. Please give me a complete list of everything (all disc) included in the purchase of a Hobby Box for 179.95. Does it include Blue Starfield Exclusive Set well as solid gold disc? I have 4 blue star field not listed here or at Topps but they show them on the list for the normal ones. Rancor, Tessek, Sabe and Pons Limbic.